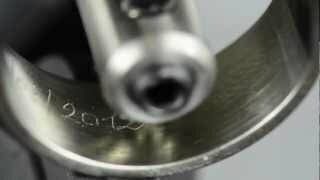 Inside and outside engraving solution for rings, wedding bands and bracelets. The M10 makes diamond engraving affordable, practical and easy to use, for a true professional finish. A lightweight device: the M10 Jewel is designed to be used in a shop, jewellery workshop, a kiosque or on an event stand. The machine occupies less space than an A4 sheet of paper, which allows it to be installed anywhere at all. Diamond engraving is very quiet and does not cause any chipping. With very little maintenance required, it is ideal for a boutique or small workshop. Developed in partnership with demanding jewellers, the M10 Jewel comes with all the accessories needed for ring engraving. Error free, thanks to the engraving assistant, optimised fonts and fully automated adjustments, plus red pointer simulation prior to engraving. A few minutes is enough to successfully complete an engraving job and obtain an excellent outcome. Texts, symbols and logos are very easily positioned on the engravable object thanks to the GravoStyle™ software assistant. The composition is simulated on this interface before engraving begins, which avoids any errors. It is easy to install the tools and objects for engraving. The diamond tip is automatically adjusted on the Z axis to produce outstanding results almost instantly. The M10 Jewel solution includes the engraving machine, control software, accesorries and user manual. Are you a jeweller? Here are some solutions for you!